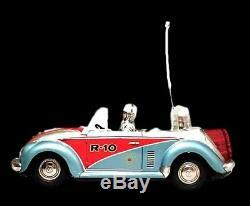 1960s NOMURA VW Beetle Space Patrol Car R-10 with Original Box SCARCE. 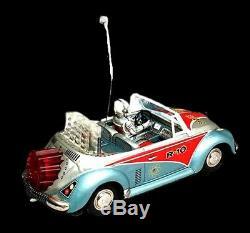 This NOMURA TOY VW Convertible is perhaps the premiere of all Japanese Volkswagen Cabrio collectible tin cars. 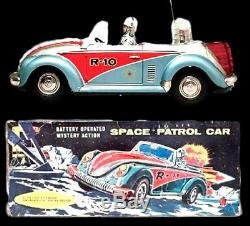 A very nice tin plate Cabrio with the top down depicting a Space Patrol car driving on the moon. If you can believe that! The lithograph body graphics are a combination metallic blue, red and silver. Tin parts for the hood VW emblem, trim, handle, and door handles. Graphics also include turn signals, door seams and R-10 & Space Patrol lettering. The lithographed interior looks like the inside of a space craft with all kinds of controls, radio, levers, switches, lights, gauges and a dashboard with a steering wheel. Certainly enough gadgets to get any VW safely through space. The tin driver looks like an astronaut in a space suit with helmet. There is a metal windshield with a plastic insert, to deflect meteors, that is mounted to the body. A special whip antenna attaches to the body. The rear of the Space Patrol VW has no 4 cylinder engine but it does have what appears to be a red plastic nuclear powered, rocket booster, power plant, with after burners. When operating, there is a red glow from rocket engine and red light that moves back and forth inside clear box above engine. Having those lithographed headlights, taillights and stop lights comes in handy when driving on the moon as well. The metal chassis is painted black and there is a battery compartment that holds two D cells. Electric motor, with rubber tires and metal hubcaps, for just forward drive from a switch under rear bumper with manually adjustable front wheels. The front and rear bumpers are tin and have a metal spring in the middle of the bumpers for I would guess for bouncing off of moon rocks. 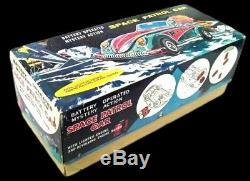 The original box cover shows the Space Patrol VW in action on the moon. Toy and original box are in excellent condition. Impossible to find in this condition and with its ORIGINAL box. Same model as seen in The Tin Toy Museum Volume 2, page 36 (with white windshield aka version 2). For the description and the support. Dont forget to check their website. 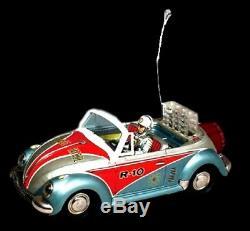 The item "1960s NOMURA VW Beetle Space Patrol Car R-10 with Original Box SCARCE" is in sale since Tuesday, July 31, 2018. This item is in the category "Toys & Hobbies\Vintage & Antique Toys\Tin\Vehicles". The seller is "vintagetoys2k12" and is located in Hawthorne, California.